The events of five weeks ago haunt the stadium and surrounding area. Many fans of both clubs visited the vast display of shirts, scarves and flowers at the site of the accident. Most walked in silence, the few who spoke did so with hushed voices: all trying to absorb the enormity and finality of that fateful night. In the ground Watford fans displayed enormous solidarity with Leicester City Football Club and fans. 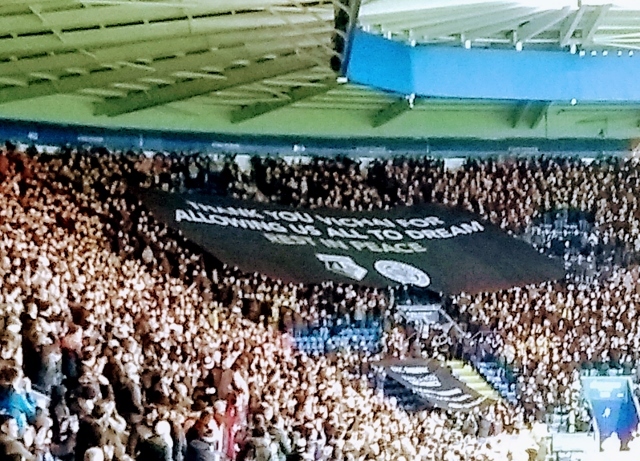 They unfurled a huge banner which included the badges of Leicester and Watford and the message “Thank you, Vichai, for allowing us all to dream.” It was a reminder that Leicester’s title win set a benchmark of aspiration for many clubs. Vichai’s son Top responded to the Watford fans by waiving charges for half time refreshments in the away section. After these raw moments the football arrives as an afterthought. But this win mattered to Leicester. The previous three premier league home matches had yielded just two points. This victory against a good team was a welcome boost as we enter a busy period of fixtures. It also showed Leicester can vary their tactics from possession-based to counter attack. After a cagey start from both sides Watford threatened through good runs from Pererya and Holebas. At the other end Ndidi had the ball nicked off his toe as he was about to shoot following a corner. Maddison then played a beautiful through pass to launch Vardy but the striker was shepherded to safety by Mariappa. Leicester took the lead in the 12th minute. Mendy gathered the ball and fed Maddison whose early through ball found Vardy running in behind the Watford defence. Goalkeeper Foster came off his line to meet Vardy and his desperate dive brought the striker down. Foster made representations of innocence but it was a nailed-on penalty. Vardy’s spot kick was very cool, driven low and hard into the right hand corner of the net with Foster diving to the left. Leicester looked good value for the lead with Mendy and Ndidi at this point patrolling and controlling midfield. Another attack saw a good cross from Albrighton clear the head of the incoming Vardy by a fraction. Watford responded well and applied some sustained pressure down Leicester’s left flank. It was from defending this pressure that Leicester extended the lead in the 23rd minute. Chilwell conceded a throw in when preventing a Watford corner. City pressed the throw well and the ball went to the hard working Gray in the Leicester box. He played a good forward ball to Maddison in the inside left channel. Maddison turned inwards and found Vardy whose superb shoulder drop left his marker both rooted to the spot and staring into space. Vardy sped away and passed to Albrighton on the right wing. Albrighton’s first time cross to the edge of the area found Maddison surrounded by two defenders. Maddison’s keepy-uppy control via his knee and boot was breathtaking and he volleyed the ball fiercely past a helpless Foster. This was a brilliant goal, reminiscent of the breakaway goals of the title winning season and one which combined both great individuality and team work. 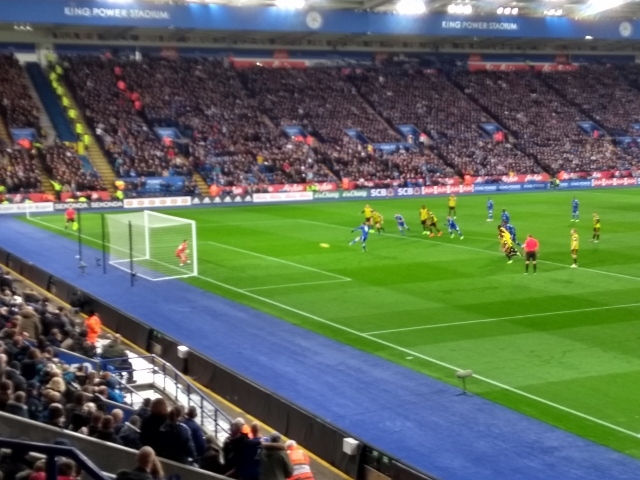 Watford nearly hit back immediately but firm Leicester tackling saw off the threats from a Watford free kick. Success then made a good run but City dealt well with the ensuing corner. At the other end Pereira, combining with Albrighton, sent his first time shot over the bar. Watford came back and Schmeichel had to be quick to stop Hughes reaching a through ball. Watford were certainly enjoying most possession. Even so, Maddison won the ball and fed Gray whose shot was deflected for a corner. Watford broke from the corner and Success closed in on goal challenged by the hard-working Mendy. Success took his shot early but blazed over the bar. Leicester were putting themselves under pressure by conceding several free kicks around their penalty area but dealt effectively with threats up to half time. The second half continued as the first half ended. Watford had most possession, assisted by some careless Leicester passing and also some anywhere-will-do clearances by the home team’s defence. Schmeichel made a smart save after Watford gained possession having clattered Chilwell from behind. Then Pererya burst into the Leicester penalty area but shot across goal for a goal kick. That was his last contribution as he and Deulofeu made way for Deeney and Andre Gray. The latter did not have a productive half hour, missing three chances including one swing-and-a-miss and a header that he placed gently wide of the goal. Meanwhile Leicester made the occasional counter-attack. Vardy did superbly well to gain a corner despite the attentions of three defenders after a solo run down the right wing. Then Ricardo Pereira won the ball and burst forward before setting Demari Gray free in the area. The young winger’s shot was fierce but rattled the post before rebounding to safety. Following a free kick for hand ball against Albrighton (and a rather harsh yellow card) Watford won a corner which Schmeichel, under pressure, did very well to palm to safety. Watford still got behind City’s defence. M. Puel changed to three at the back, bringing on Soyuncu for Gray, and then Iheanacho came on for the excellent Vardy. Let’s hope the January transfer window will see the recruitment team bringing someone to give Jamie support. 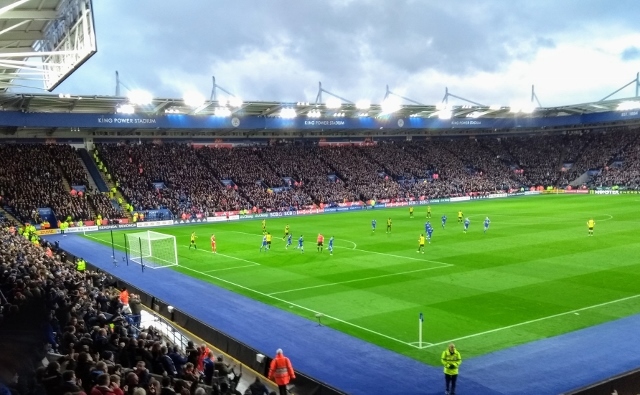 Leicester nearly nicked a third when a superb Albrighton pass sent Maddison through but the alert Foster cut out the danger. Iborra came on for Evans and City reverted to a back four. Morgan made a superb block to keep away a Chalobah effort then cleared a ball heading straight to Deeney who would have had a clear shot. Ndidi shot over after good work from Chilwell and Maddison. 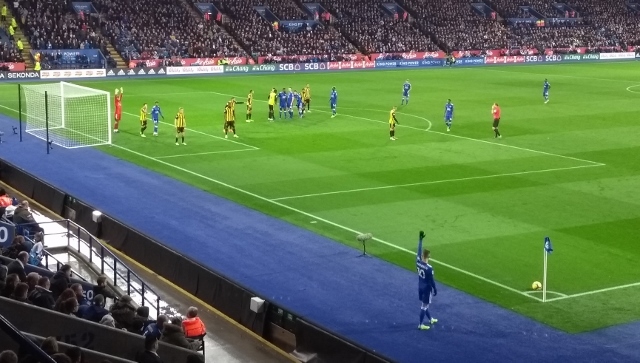 Leicester seemed to have drawn the hornet sting but there was one last piece of drama when Capoue was shown a red card for a challenge on Iheanacho. 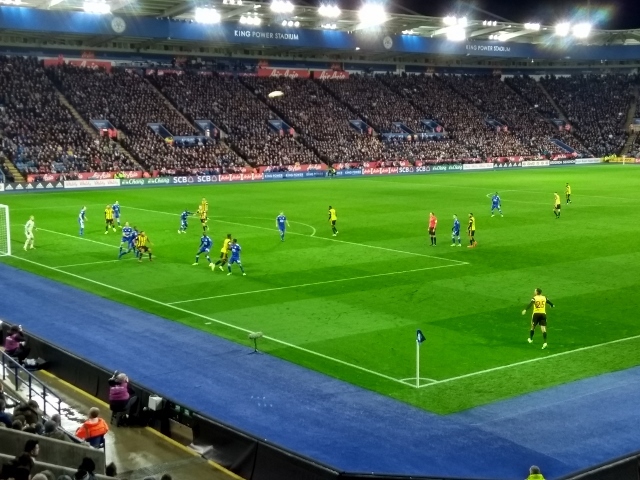 Leicester comfortably saw out added-on time, though Maddison did manage to pick up an unnecessary yellow card following some nonsense at a Watford throw-in. Watford: Foster, Femenia, Mariappa, Cathcart, Holebas, Doucoure, Capoue, Hughes, Pererya, Deulofeu, Success. Subs: Gomes, Deeney, Masina, Sema, Chalobah, Gray, Kabasele.